Loved the cup and saucer at Casa Enrique, a mom and pop paladar in Playa Larga, Cuba so we bought a set. Original Cuba images by PillartoPost.org. In the mid-1700s growing coffee was introduced to Cuba and by 1790 significant amounts of coffee beans were being exported to Spain. Cuba’s coffee industry expanded when French coffee farmers who had fled the revolution began farming in Cuba. Coffee sales exceeded Cuba’s sugar sales in the 1820s and by the early 1950s coffee exports reached 20,000 metric tons. The Cuban Revolution of 1956 nationalized coffee farms and began the decline of the industry. Cuban coffee production continued to languish during the 1960s and 1970s and then surged in the late 1970s and into the 1980s. The principal benefactor of Cuba was the Soviet Union and with the fall of the Soviet Union in 1990 Cuba’s industry once again began to wane. One important coffee growing region is located in the eastern part of Cuba in the Sierra Maestra Mountains. The climate is favorable and the fertile, reddish-brown soils rich with humus allow for coffee cultivation without the need for chemical fertilizers, providing Cuba with a bona fide reputation for growing coffee. Towns in the Sierra Maestra have a history of coffee cultivation done by hand-picking the coffee cherry from the tree. Many of the coffee is grown on steep hillsides, carried out of the area in sacks on the shoulders of coffee farmers and then carried by mule to drying areas. The traditional preparation method among the mountain people is to roast the coffee beans and then pulverize the roasted coffee beans in a wooden “Pilone” (mortar). Then the coffee is steeped in hot water and the coffee grounds strained out using a cloth handbag. Another main coffee growing region in Cuba is the Escambray Mountains in the center of Cuba. In the west coffee is grown in the Guaniguanico and in the east coffee is grown in the Nipe and Sagua-Baracoa Mountains. Difficulties in Cuba coffee growing include excessive rainfall followed by drought and poor roads. The use of mules for transport and traditional methods are still commonplace. The poor roads also hinder access for needed labor on plantations. U.S. Tourist sipping a Cafecito at the El Dorado paladar in sunny Trinidad, Cuba. The drink “Cuban Coffee,” also called Cafecito, Cafe Cubano or Cuban, is a type of espresso coffee that first developed in Cuba after Italians arrived in the country. The Cafecito (Cafe Cubano; Cuban Coffee) beverage is made by sweetening a shot with demerara sugar, during the coffee brewing process. There are variations on the method including a variety of recipes. The demerara sugar is traditionally added into the vessel into which the espresso will drip so the sugar and espresso mix during brewing which is said to create a and smooth quality. The unique flavor of a Cafecito is created due to the heat of the with hydrolyzing sucrose (sugared water) causing a taste that differs from the taste created by adding the sugar at the end. Many prefer to first just add a small amount of the espresso coffee and the stir it thoroughly creating a light brown paste. Then the rest of the espresso is added resulting in an “espumita” or light brown foamy layer sitting atop the beverage. Cafecito or Café Cubano - The traditional and one of the favorite types of Cuban Coffee. It is brewed with ordinary coffee beans and sweetened with sugar. It is twice as strong as American coffee and served in a small cup. Colada - If you want to share your Café Cubano with friends, order this. It is a larger cup of Café Cubano that comes with smaller cups to serve your guests. Four to six shots of Cuban Coffee served in a large glass along with numerous small demitasse cups is known as a Colada and intended for sharing. Café Con Leche - A Café Cubano that comes with hot, steamed milk in a separate cup. 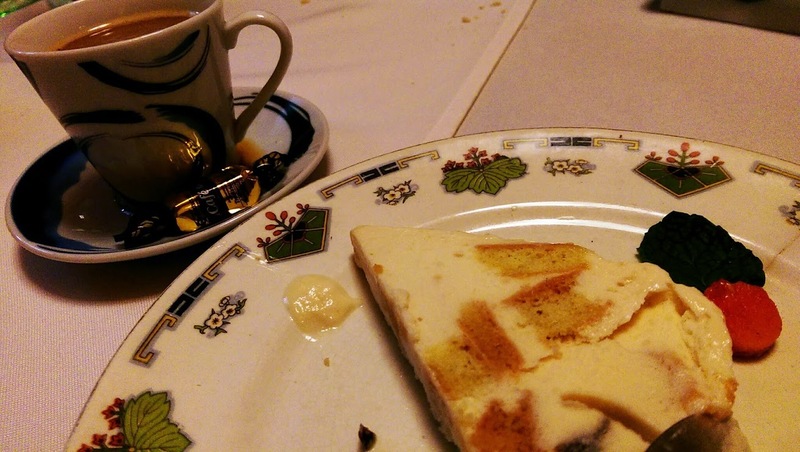 You simply pour the milk into the espresso and enjoy. Cortadito - A Café Cubano mixed with several tablespoons of steamed milk. 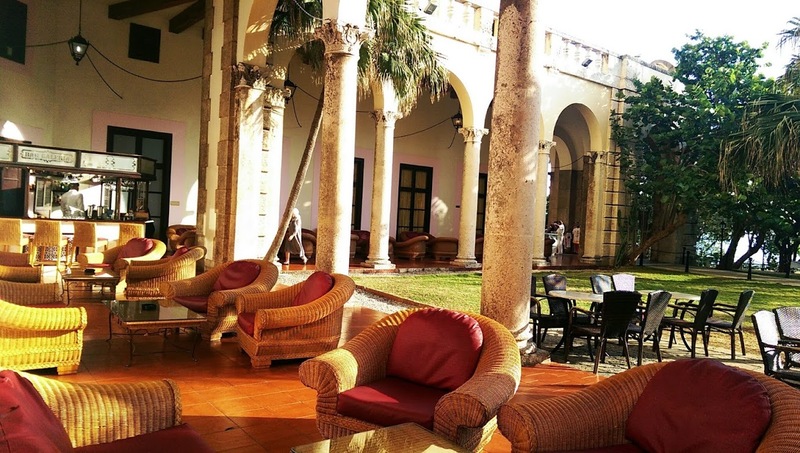 Morning treat: Café Con Leche while enjoying the outdoor lobby seating at the Hotel Nacional de Cuba in Havana. 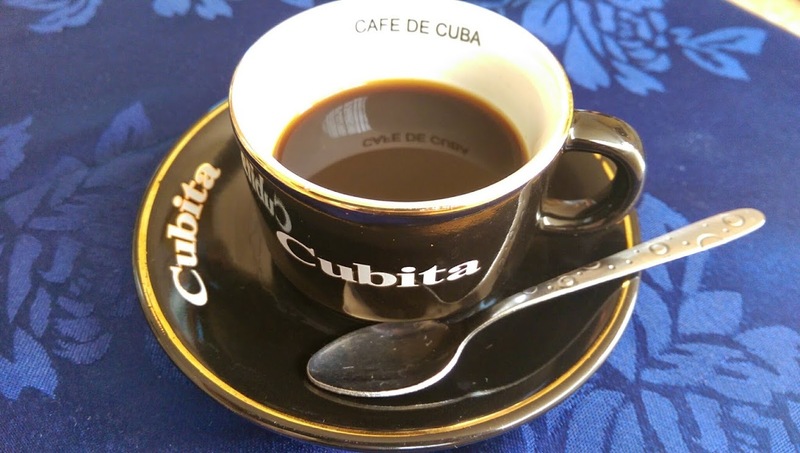 In Cuba, as well as among the Cuban exile community globally, the consumption of Cafe Cubano (Cafecito) is a prominent daily cultural and social activity. If you should have the fortunate opportunity to visit Cuba, you must savor the experience and enjoy a Café Cubano. You won’t be disappointed! Dessert and cafe con leche at Paladar La Moraleja in Havana. From there we retraced steps to our hotel (Nacional) for brandy and cigars at the tiny all-night Churchill Bar.